Valentine’s Day is a day most well-known for flowers, chocolates, greeting cards, and love, but more recently, people have started having a negative view of Valentine’s Day. 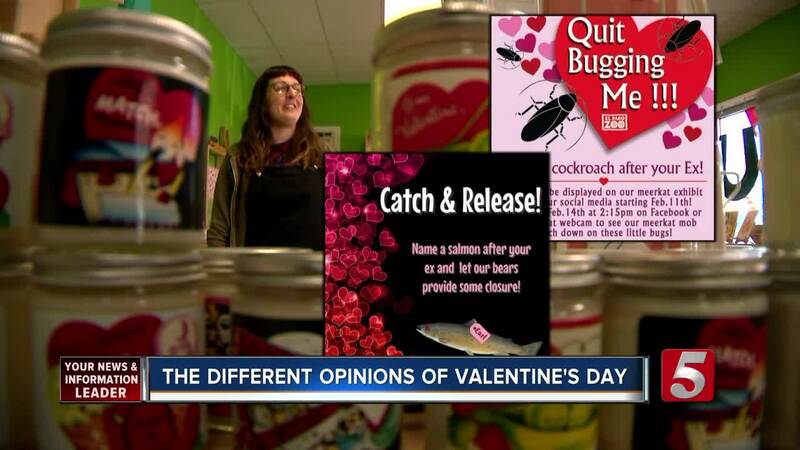 NASHVILLE, Tenn. — Valentine’s Day is a day most well-known for flowers, chocolates, greeting cards, and love, but more recently, people have started having a negative view of Valentine’s Day. Hooters is offering a buy 10 wings and get 10 for free deal if you bring in a picture of an ex and rip it in half. There are also promotions around the country that allow you to pay a small fee in exchange for having a cockroach named after your ex (which will be fed to meerkats) or to h ave a salmon named after an ex that will be fed to a bear. People also choose to ignore Valentine’s Day, and instead, celebrate Singles Awareness Day on the day after Valentine’s Day. Still, plenty of people are still celebrating love in Nashville, as is evident at Gift Horse in East Nashville. Valentine’s Day is one of their busiest times of the year. They sell plenty of greeting cards and other gifts. “I think it’s just a good day to show love to friend, partner, yourself, do something nice for yourself,” Jessica Maloan of Gift Horse said. From her viewpoint and seeing the joy that Valentine’s Day can bring to people, Maloan thinks instead of focusing on the negative, it’s much better to focus on the positivity.